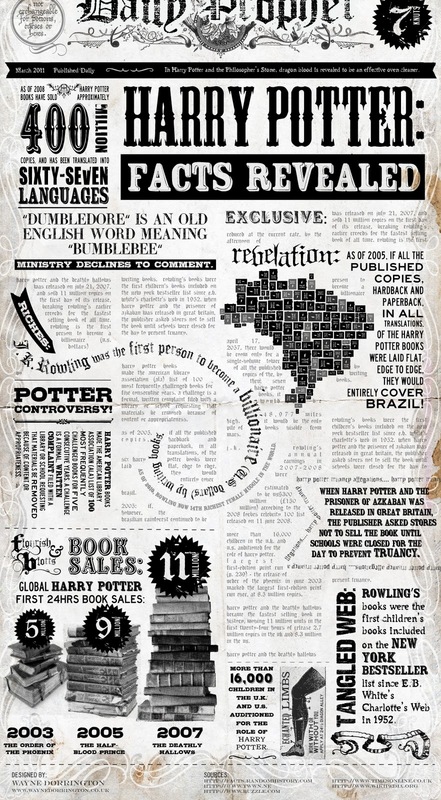 For my 6th infographic I've delved into the world of Harry Potter and pulled together some facts and statistics around the books and J.K. Rowling. The style is based on the kind of on-screen prop "Daily Prophet" newspapers used in the movies - as I've looked into it, they all looked really different from movie to movie - so I've cherry-picked my favourite bits from each and designed it how I would have done it. Hope you like it. And remember: its "levi-Oh-saa". Designer, Illustrator, Art Director and 3D Enthusiast working at Beyond in London. Spends much of his time experimenting, tinkering and mucking about with pop-culture graphics, animations and generally stuff he has no idea how he's going to actually pull off. It should say "revealed", not "reveaed"
Whoah! Good catch Lex, thanks. Corrected. I'm not good with text - I'm better with icons and stuff. I’m calling BS on the claim that the Harry Potter books would cover Brazil: if there have been 400 million copies published and each book covers one square foot (an overstatement for most copies), that would only be 400 million/5280^2 = 14 square miles, much less than Brazil’s 3.29 million square miles. Am I missing something? 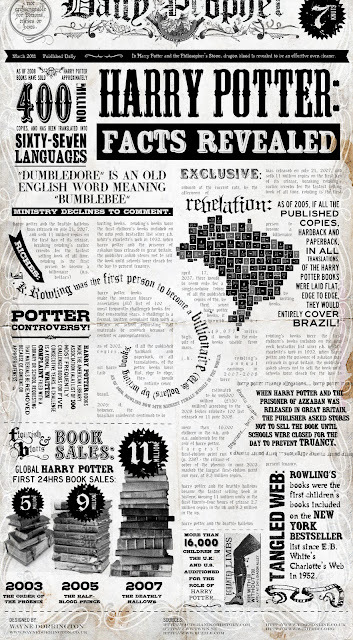 nice looking infographic, but you are dead wrong about 'the books covering brazil'. brazil is 3,287,597 sq mi. assuming a single book is 9.5"x6.2", it has an area of 58.9 sq in. multiply that by the 400M books printed gives you 23,560,000,000 sq in. converting to sq mi gives you ≈5.87 sq mi. not even close! to actually cover brazil, it would take 224,075,109,766,371 books. Thanks for complimenting the infographic and taking such an interest in the details. It's of course, not my data in the infographic, (I state the sources at the bottom of it) but as I read it, that particular statistic covers all the books in ALL the language versions. But as I say - not my source. Also, it's just a bit of fun and not a sworn document. anyway, as i said, i genuinely think the graphic looks great. but unless i am missing something major, the # of books required to cover brazil is staggering to say the least. Wow, some people sure do get caught up in insignificant details... I think its quite fabulous! We really are the Harry Potter generation! From here on, people will never know what it's like to wait for a HP book or movie to be released. I hope future generations love HP just as much as we do :). Fun graphic, I discovered it on Pinterest. A whole generation grew up with the Harry Potter stories.